Six years ago we completely gutted out our living room and the bedroom and bathroom above the living room. Insulation was added, drywall hung and finished, completely new bathroom installed in the upstairs and hardwood floors laid in the living room and the dining room. The woodwork in the living room was all removed to be stripped, painted and put back in. A year ago, 5 years after the project was started, I finally convinced my hubby to just go buy new wood and at least get the woodwork up around the two windows in the living room. This year, I finally saw accomplished what I have asked to have done by Christmas – for 6 years! I’ve had 2 sets of shutters that came off an old church hanging out around here just waiting to be hung at my windows. On the inside. Instead of curtains. 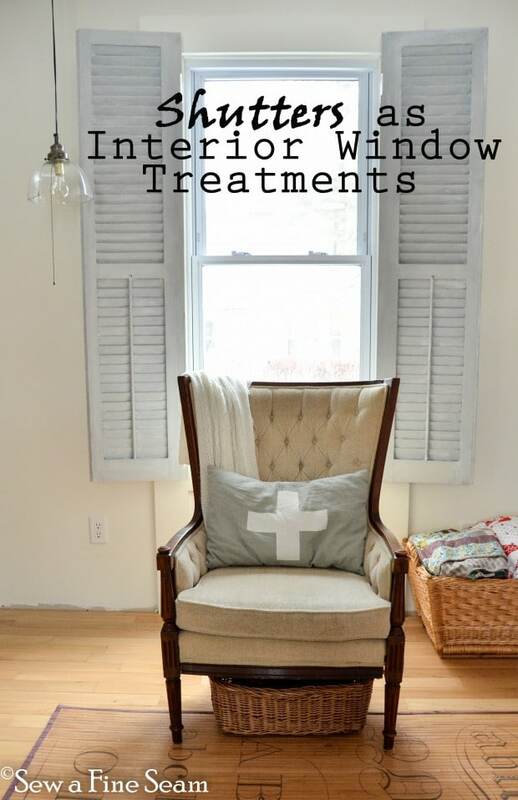 Shutters as Window Treatments. 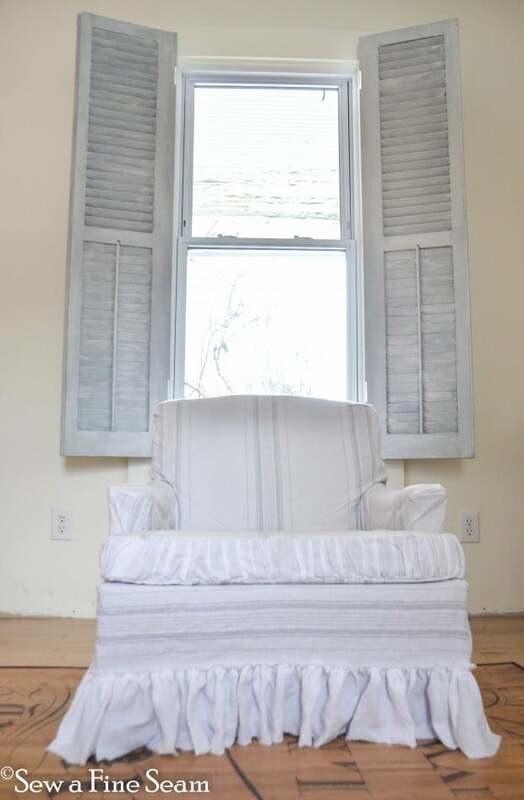 I wish I could put vintage shutters at all my windows I like these so much! I do have to admit that in one way I am glad it took 6 years for my husband to finally get the shutters ready to be painted and hung. If I’d painted them six years ago I would have used latex paint. About a year and a half or so ago I discovered chalk paint and would have used that. But now? I used Miss Mustard Seed’s Milk Paint and I couldn’t be happier with how they turned out. Shutter Grey topped with a thinly mixed layer of Grain Sack, then hemp oil and lastly a bit of white wax here and there. I love the color, I love the look, and most of all I love the functionality. 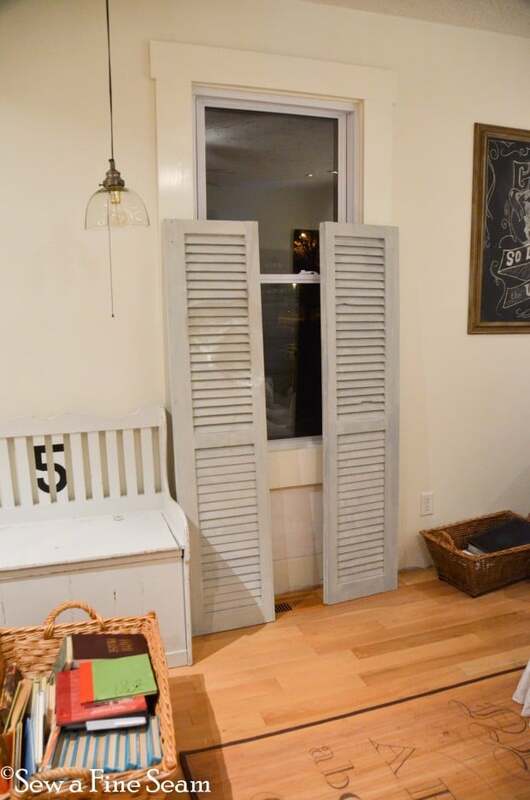 My husband had to add a strip of wood along the outside edge of each shutter to make them wide enough to cover the windows and come together when closed. Then to make the hinges we bought work he had to notch out for each hinge. 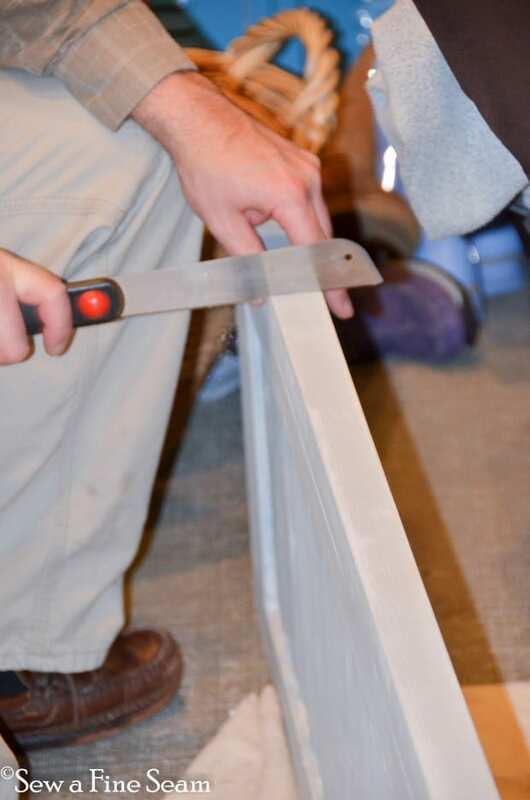 He used a hand saw to make the cuts at either end of the notch. 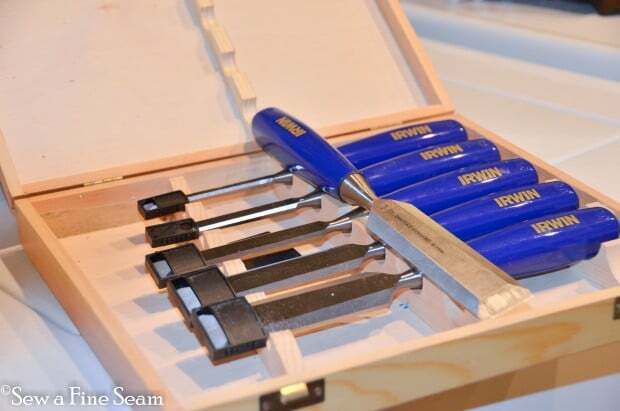 And then used his chisel set to make a neat, perfectly sized notch. I didn’t bother to keep track of how many times he took each shutter down to make minor adjustments to the notches or the way the hinge was attached. I do know it took him 2 hours just to get the shutters hung at one window. His attention to detail is rivaled by no one I am quite sure. I had them hung so the side you see most of the time had the piece on them that used to open and close the slats. What is that piece called? Surely it has an official name?! I am so happy with the way they turned out. Now if the weather would just warm up maybe we’d get in the mood to finish up this trim project and cross it off the list. Stay warm and I hope you are well stocked with bread and milk – LOL!!! Jill, the shutters look wonderful! …and so does your home! Your husband did an expert job installing them. Our design process here on 34th street is slow at times too! It’s all about time and finance. I love your “worth the wait” optimism. I waited years for new floors…I appreciate them all the more! We have four rooms and the hallways finished… six rooms to go. Thanks Lynne! It does seem that the longer I wait the more I appreciate it once it gets done! Thanks Pam, I’m loving them more all the time! They were worth waiting for Diana! Most great things are! I loooove the shutters! They look so beautiful! It gives the room a European or Nordic feel to it! Thanks Lisa – and that is exactly the look I was hoping it would give! I love the shutters and the finish you used on them. I’d say they were worth waiting for. Love the first picture. 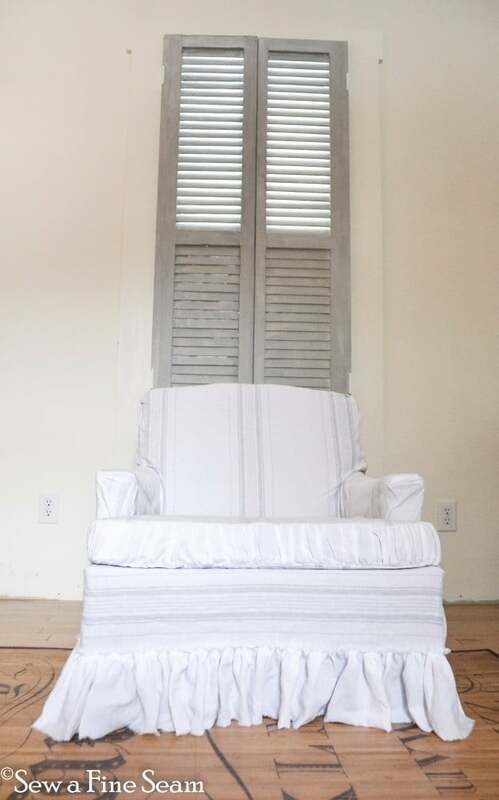 The chair,pillow,light,rug baskets and shutters. Love it all. Thanks Michelle – creating the room I have in my head is a process! But it’s a fun one – I loved that photo too! 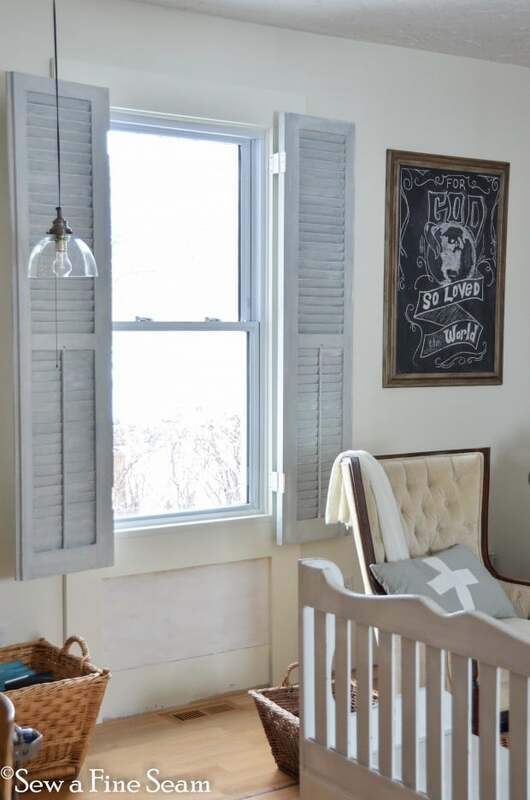 Love, love, love the shutters! The finish is not my style but it’s perfect for your house! Was glad to see the picture of Travis with his undershirt on…I was going to ask if he ever wears “comfy” clothes. 🙂 He even had his shoes on 😉 Looks like were worth the wait. Would love to see before pics of your house! Thanks Jenni! I need to dig out the old snapshots of our house and scan them – or there might be a few old digital ones I could use. It does make it so much more fun to see the before! And the ‘shoes’ Travis was wearing are actually leather moccasins – he wears them all the time in the house in the winter. He’s pretty preppy most of the time – I can’t even get him to wear polo shirts – he’s a button up guy! Absolutely gorgeous! I love interior shutters…especially vintage! I’m excited to see what you choose for the walls.Well done! Stay warm…spring’s on the way! Great job you two! 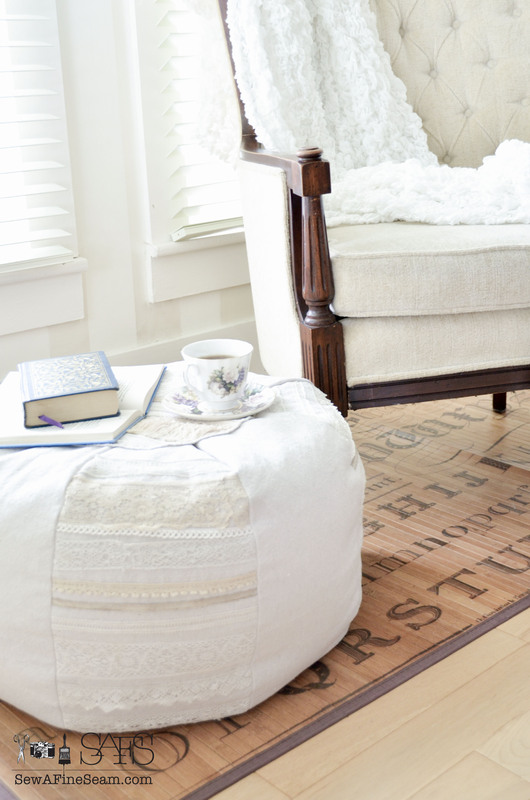 Looks fabulous – charming and functional to boot. You lucky girl. I am the “handyman” in my house. And your hub does not do slipshod work. You are twice blessed. Big applause to the two of you. Thanks Beverly! You are so right – my hubby does the best job every single time! Can I have your house here in CO? love your house Jill, love so much how you’ve decorated everything. I’m still waiting for my walls to get painted since 2006,yup. Can I have that great chair under your window with shutters? 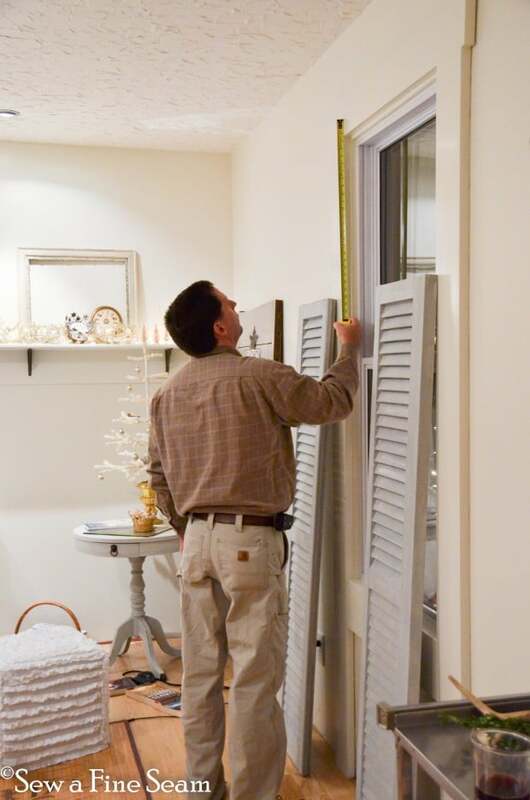 I so wish we’d brought the shutters like those we left in KY. I’d love to have shutters on windows, might keep rooms warmed in winter and cooler in summer. We have to close the curtains and blinds during the day in summer due to sun. Back of our house faces west and boy does it get hot. Love how your painted the shutters, awesome colors. As the lady above said, your photos are great, look so professional. Another career? LOVE this creative and unique decorating idea! I had no idea about Miss Mustard Seed’s paint. Thanks for the tip. Going to check that out now! Visiting from Blissful Whites Wednesday! Thanks Roselle! 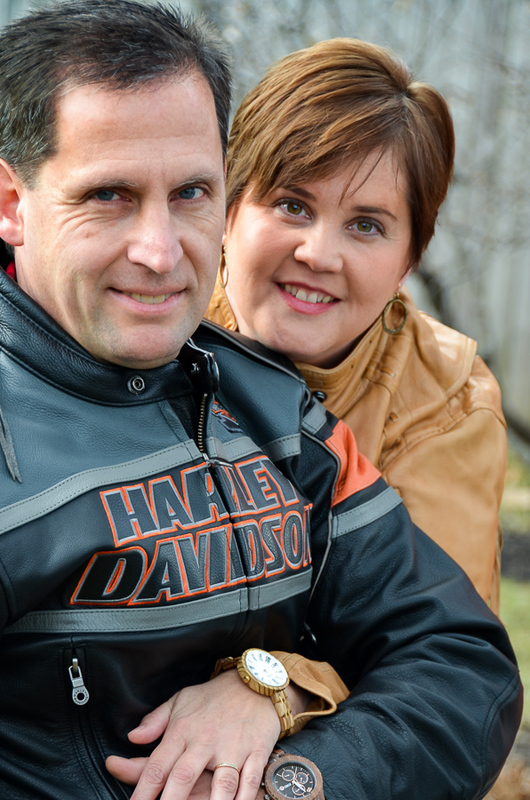 Check out Miss Mustard Seed’s blog! She’s an amazing blogger to follow. The wait and hard work was totally worth it! I absolutely love this idea! And the color you picked was amazing! Jill this project turned out so cute! I am sharing at my party today. Thank you so much for linking up. I love it! Awww, thanks Karen! 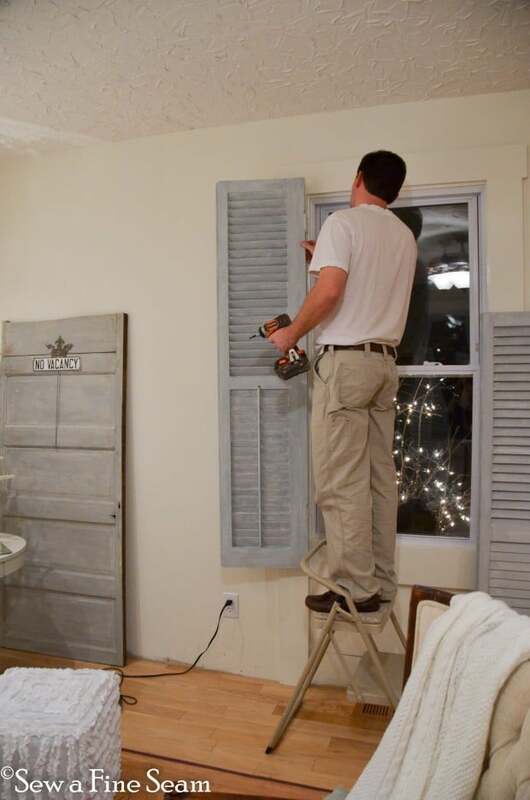 I love my shutters – can’t wait to see them featured at your party! on this week’s Fridays Unfolded! Thanks so much Alison! So fun that your link party is back up and running! When I was growing up, we had shutters like those in every room in the house. Of course I didn’t appreciate them then. Yours look great! Thanks so much Kathryn! Love your party and so excited to be featured! 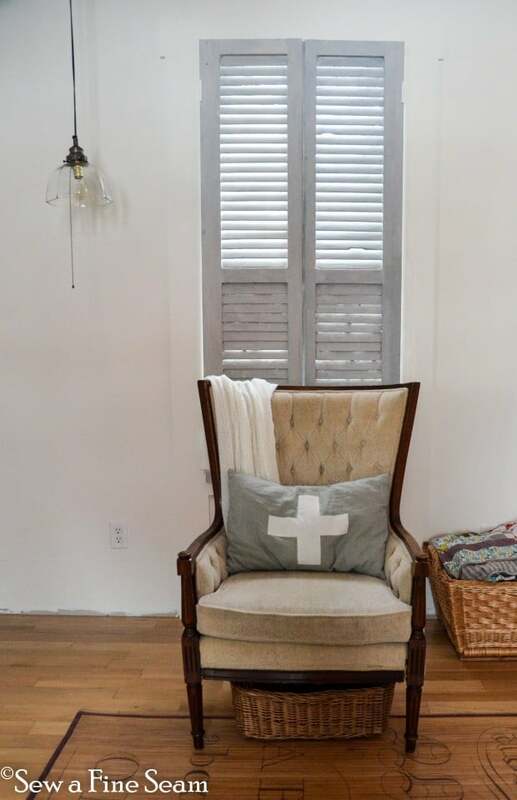 I love your shutters and your chair pillow! Pinning:)I’ve always wanted to have indoor window shutters on a large window. I’ve seen them at my local salvage barn. Gotta pick some up and try this! Thanks Michele! I am loving them more all the time so I say go for it! 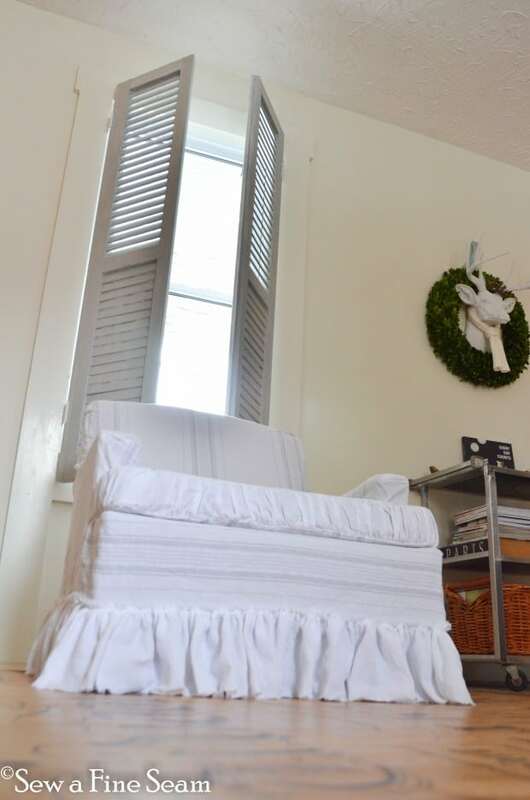 Thanks again for featuring my shutters Lauren! The shutters look absolutely fabulous. I am at the moment doing up both the inside and outside of my house and plan to have shutters on the outside and also I want them on my bedroom and the main bathroom (inside). I have some old French shutters on my wall above my bed that I used to create a headboard. However I am re-doing this room and moving my bed against a window and feel that I need something more than roman blinds (existing) behind it and so planning on shutters there too. I have to have them made especially as we cannot get any to fit and it is terribly expensive in New Zealand but I think worth the effort. If you want to look at my bedroom post which is an old post when I first used the shutters on the wall, they are original antique shutters from France, still with the original paintwork. Great look. You are blessed to have a handy and willing husband. I love shutters. Having room to open them back in the room is great during the day to bring in light. I would love for mine to do that but I have too much furniture in the way. Thanks Bonnie, we are loving them! gorgeous! love how you used the shutters Jill. 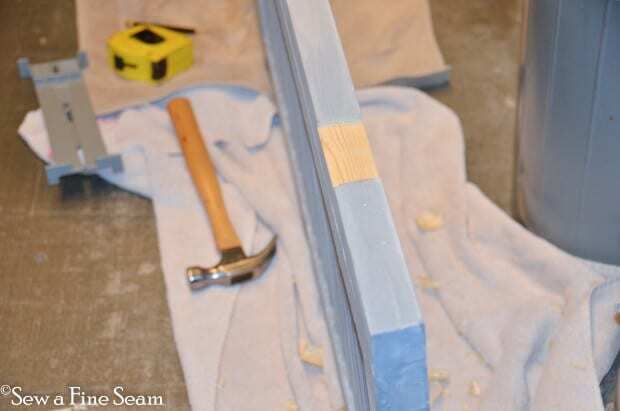 i have yet to try MMS milk paint… thanks for sharing what colors you used. God Bless! Thanks Mimi! I love my shutters more all the time! Oh Jill – I’ve been looking for shutters for the living room for a month now – I want to do the exact same thing and can’t find any!!!!!!!!! They look amazing – what a gorgeous job you did on painting them – I haven’t tried MMMS milk paint yet – but have to! Oh Suzan I wish I could bring you some – they aren’t hard to find around here. I’m loving milk paint more all the time and use it more than chalk paint now! Even if this project was done 6 years later than planned, still, good job to you and your husband! Even the shutters alone just gave much character to the room, which is more so because of its colour. Thumbs up! I love my shutters and think they are the best window treatment ever!